Cúlóg is the 786th highest place in Ireland. Cùlòg can be accessed from L87901 55560 A. 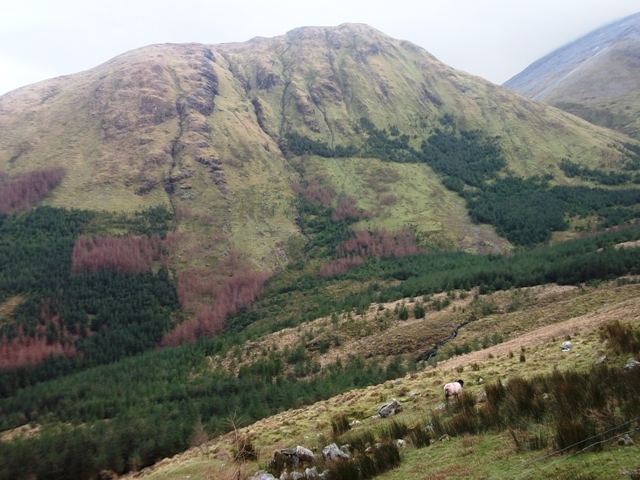 The starting point is in the Glenlosh Valley, which is privately owned. It is advised to seek permission from the landowners who live in the last house at the end of the valley. Starting at one of the valleys holiday cottages, it's a pleasant walk along a good (but wet) track initially, then following the banks of a rushing mountain stream. A steep uphill pull then brings you across an unspoilt heathery plateau to the high point. There are great views over to the nearby main Maamturks. The unspoilt nature of this summit means there are no tracks through the heather on the last several hundred metres of the walk across the top. For those already up on the main Maamturks ridge, an approach can be made from Loch Mhám Ochoige. From the lake descend north-eastward to the col between Loch Mhám Ochoige and Cúlóg, and head up to Cùlòg from there.